Quite awhile ago my son got a free stamp in the mail. The only stamp pad I have is a really pale blue so it wasn't too fun for him to play with. When he asked about it again I decided to buy some more stamp pads. When I got to the craft store all their stamps were 50% off (I love Hobby Lobby!)... so I let him pick out a few stamps as well. At home we got out some scrap paper and I let him go at it. He had a blast stamping! Then I showed him how to make fingerprints. He thought that was really cool. 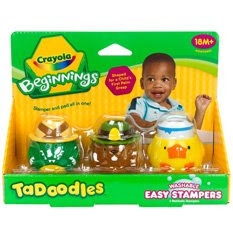 And for younger kids, I'd recommend Crayola's Tadoodles. These are the coolest little stampers. 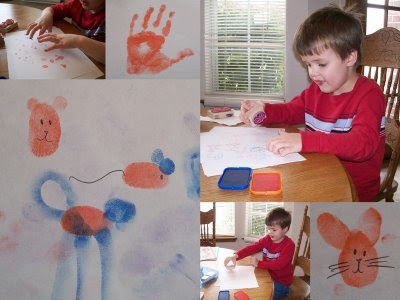 My boys have a great time stamping away and I don't have to worry about ink getting all over their hands or my house! We have the very same Nicholas stamp. :) After your post, I'm getting excited for Garrett to be old enough to enjoy using it. That is so cute. I love the finger print pictures. Thank you for such fun ideas. I had forgotten we had stamp pads and my kids loved this activity today. I really love your blog! I saw you featured on Sugardoodle several weeks ago. You have such fun, simple, creative ideas! Thank you again! I think your blog is great! In fact I like it so much that I have just awarded you the One Lovely Blog Award. 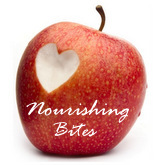 Have a look at http://nurturemama.blogspot.com/ for more details.